England and Australia played the second test of the Ashes 2013 at Lord’s from 18-22 July with England leading the series 1-0. After winning the toss and electing to bat Australia managed to score 361 in their first inning thanks to Ian Bell’s 109 and half centuries by Trott and Bairstow. Little cameos from Broad and Swann at the end took them to a decent total. Ryan Harris playing his first match in series picked a 5-wicket haul. 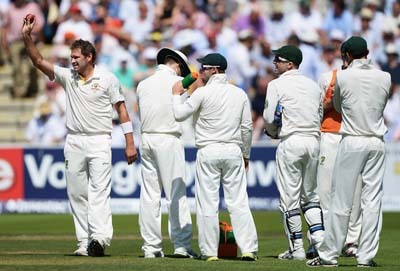 Swann’s 5 wickets demolished Australia as they could score only 128 with only Watson scoring 30. Skipper Cook without asking Australia to follow on began their second inning. The star was the young Joe Root who piled up 180 and England set 583 for Australia to win. Australia could score only 235 and lost the test by 347 runs. # Lord’s was hosting its 127th Test Match. # England and Australia were playing their 34th Ashes test at Lord’s. # Ian Bell brought up his 19th Test 100. This was his 3rd consecutive Ashes 100. # Ian Bell became the 5th English batsmen to score 3 consecutive Ashes 100s. Other 4 were Jack Hobbs (Twice), Wally Hammond, Chris Broad and Bob Woolmer. # Jonny Bairstow scored his 4th test fifty and 3rd at Lord’s and first in Ashes. # Last time any English No.11 scored 25+ runs was Monty Panesar who scored 26(28) vs Sri Lanka at Nottingham in June 2006, 7 years ago. # This was the 14th time an English No. 11 scored 25+ in an Ashes Test and only 4th in England and first at Lord’s. Last to do was Andy Caddick (49* off 40) at Birmingham in 2001. # Stuart Broad batted at No. 10 in this innings and scored 33 (29). This was only his 3rd inning at No.10. # Similarly Anderson came to bat at No. 9. This was his 3rd inning at No. 9. # Brad Haddin effected 5 dismissals as Wicket Keeper (All 5 caught). Last Australian to do so in Ashes was Gilchrist in 2007 at SCG. # Ryan Harris during his 5-wicket haul (5/72) completed 50 Test Wickets. # Ryan Harris’ 5/72 was the 500th 5-wicket haul in History of Ashes. # This was Ryan Harris’ 3rd 5-wicket haul in his Test Career. # Steven Smith picked 3 wickets for 18 runs. This was his career best bowling in Tests so far. # Australian inning had No Duck and No 50s (Highest was 30 by Watson). Last similar occasion for Australia in Ashes was in the 2005 also at Lord’s. Australia scored 190 with No Ducks and highest being 40 by Langer. # Graeme Swann picked his 16th 5-wicket haul in Test Career. This was only his second 5-wicket haul in Ashes. Previous was 5/91 at Adelaide in 2010. # Australia’s total of 128 is their lowest total at Lord’s in last 45 years. Australia were bundled for 78 in 1968. 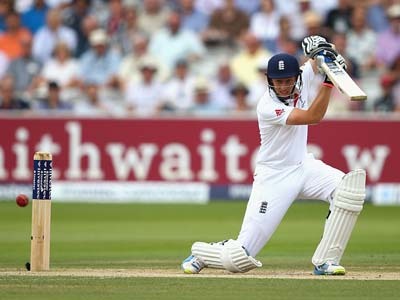 # Joe Root scored his second Test Hundred and also achieved his career best score of 180. # Joe Root became the 66th England player and 154th overall to score a Test 100 at Lord’s. # Jonathan Trott got his 5th Duck in Test career. His 3rd against Aus and 2 were against India in India in 2012. # Joe Root @ age of 22years and 202 days became the youngest English batsman to score an Ashes Hundred at Lord’s. Previous youngest was KS Duleepsinji who scored 173 at Lord’s in 1930 @ age of 25 years and 14 days. 4 Australians have scored Ashes 100 at Lord’s as younger than Root. # Before Joe Root, the last England Right Hand Opener to score an Ashes 100 was Michael Vaughan in 2003. Vaughan scored 183 at SCG. # Before Joe Root, the last English Right Hand Opener to score an Ashes 100 in England was Graham Gooch in 1993. Gooch scored 133 at Manchester. # Root became only the second player after John Edrich in 1975 to score 150+ score in second innings in Ashes test at Lord’s. 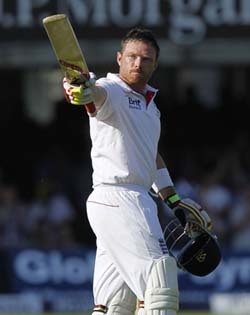 # Ian Bell after scoring a century in first inning scored a half century in second inning. This is the first such occasion for him in his career. # Last time any English batsman scored a century in first inning and a half century in second inning was Arthur Shrewsbury snr in 1893. # England set a target of 583 for Australia to win. This was the 8th time a target of 583 or more was set in Ashes and 18th time overall in Tests. # Ashton Agar picked up only 2 wickets in his 4 innings in test career so far. # Shane Watson who fell on 20 has scored only 1 50 in his last 18 test innings. # Usman Khawaja brought up his 2nd test 50. # Michael Clarke scored his 27th 50 and 7th in Ashes. # Swann’s match figures of 9/122 are his best in Ashes eclipsing his 8/158 at The Oval in 2009. # Last English bowler to take 9 or more wickets in a Lord’s test was Bob Willis (9/118) in 1977. And last England spinner to do so was Headley Verity in 1934. # England never lost a test in which Bell scored a 100. In his 19 Test 100s England won 13 and drew 6. # Australia lost the match by 347 runs. This is Australia’s largest defeat in terms of runs at Lord’s. Their previous worst was by 127 runs in 1983. # With this victory England completed 50 Test Victories at Lord’s. # This was England’s 46th win in Ashes Matches in England. They equal Australia who have also won 46 Ashes matches in England. # With this defeat Australia have lost 6 consecutive Tests. This is only the 3rd time in history of Australian cricket that they lost 6 or more consecutive tests. Previous 2 occasions were 7 consecutive losses in 1885/86 vs England and in 1984 vs West Indies. # This is the 5th time England have won 4 or more consecutive Ashes tests. The last time England won four or more consecutive Ashes Tests was five wins between Aug 1926 and Feb 1929.